Fresh duck breast, either Peking or Muscovy. Peking are a bit smaller; for this recipe I used 4 Muscovy. To complete the curing brine, add salt (or Tender Quick), sugar, cure (if using), onion slice(s), Red Eye Express and molasses and boil hard for 10 minutes or until flavors are infused in brine. Inclusions for flavor can either be strained off here or left in the brine for duration of curing. Chill to 36-38°F, then add the duck breasts. Ensure they are completely covered by brine, using non-reactive weights if necessary to keep submerged. Cure for 5-7 days, rotating/flipping meat once to ensure complete brine coverage. Place on a cooling rack over a cookie sheet in the fridge and allow to air chill at least several hours or overnight. This will help the breasts to take on smoke more evenly and effectively as well as more evenly distribute brine and flavor throughout the meat. At this point, some more finely ground Dizzy Pig Red Eye Express was sprinkled onto the meat side of the breasts. This particular recipe differs from some others in that it calls for cold smoking rather than hot smoking. Cold smoking is smoking done largely without heat, in that temperatures do not get above 100°F. For this I use a hotplate set in the bottom of a Backwoods Smoker, with a pie plate of smoking chips/chunks set atop to create the smoke. If your particular smoker does not allow for cold smoking, use minimal coals set up indirect under a pan of ice cubes to replicate as best as possible, the cold smoking environment. Cold smoke for 4 hours approximately using sweet smoke wood (I used maple) or to desired level for taste/concentration. 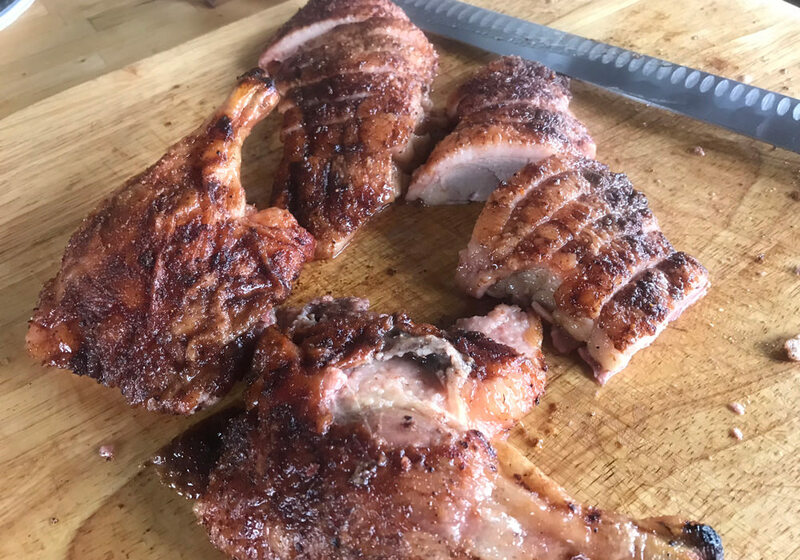 Remove breasts from the cold smoke, and let rest at least overnight and up to several days to develop flavor and to air chill to desired consistency (I found the 3rd day of resting provided the best result of firm slicing bacon-esque meat and intense woodsmoke flavor and best frying results). It was at this point that I sliced on the bias and pan fried and made some really nice coffee-molasses Red Eye Express duck bacon DLT sliders on brioche-pretzel buns. A bit of work for this project to reach fruition, but the results were well worth it! *** Project weight is total of trimmed meat weight in pounds, plus amount of water and coffee necessary to cover, calculated at 8.3 lb/gallon. For example, 4 duck breasts weighing 3 lbs plus 1/2 gallon of water/coffee to cover would create a total project weight of 3 lb meat plus 4.15 lb of curing brine, or 7.15 lb total ‘project weight’. If still unsure of how to calculate salt/sugar/cure amounts for your particular project, read the intro to the Formula for Success and follow the in-depth instructions there. Brining Duck. Note that in the picture the breasts are floating on the surface. This is only to illustrate the duck breasts in contrast to the dark, coffee brine. During the curing process, the breasts must be completely submerged.